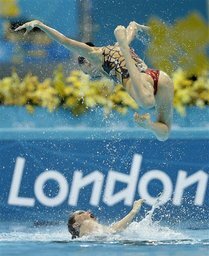 LONDON (AP) Russia set itself apart from the competition yet again at the London Olympics, winning the team synchronized swimming for its fourth consecutive gold medal in the event. The Russians showed why they've been the sport's dominant power since the 1998 world championships. Their height, speed, legwork and synchronization in the pool is far superior to anything the rest of the world is doing. And don't think other countries don't realize it. One of the hallmarks of the Summer Games, swimming has been competed at every iteration of the modern Olympics. Of course, the modest two-event program of freestyle and breaststroke at the 1896 Games bears little resemblance to the 16 pool events - and one in open water - on London's docket this summer. Learn about the different strokes, scroll through the medal leaders and take a walk through history and watch the swimsuit evolve from an old Racerback to a high-tech Fastskin. Swimming Events for the 2012 London Games have been completed.